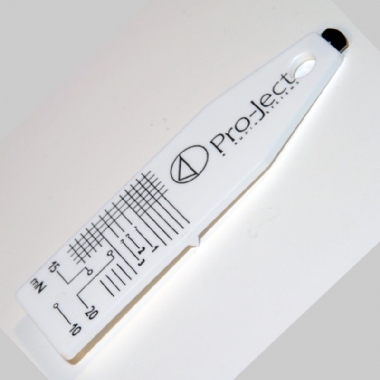 Project Tracking Force Gauge and Cartridge Alignment Protractor - inc Post and Packaging. This is a basic tool for the measuring of cartridge tracking force weight and alignment. Setting up the tracking force of a cartridge on a HiFi turntable is a simple process. Simply place the stylus tip on the desired weight, then move the tonearm counterweight forward and backward on the back of the tonearm until the protractor is level (it is pivoted like a see-saw in the middle). The lines on the protractor can be used to install and align a new cartridge in a tonearm headshell.